Whenever bitcoin reaches mainstream usage, it’s likely that people will be paying via their smartphones. So what is the current state of bitcoin apps? We offer reviews of three apps from the top three smartphone platforms: Android, iOS and Windows Phone. This app can import private keys, as well as authenticating to the Blockchain website (through a special “Pairing” process). It also has a QR code with a Blockchain bitcoin wallet address, but it can also generate QR codes with requests for specific amounts of bitcoin. 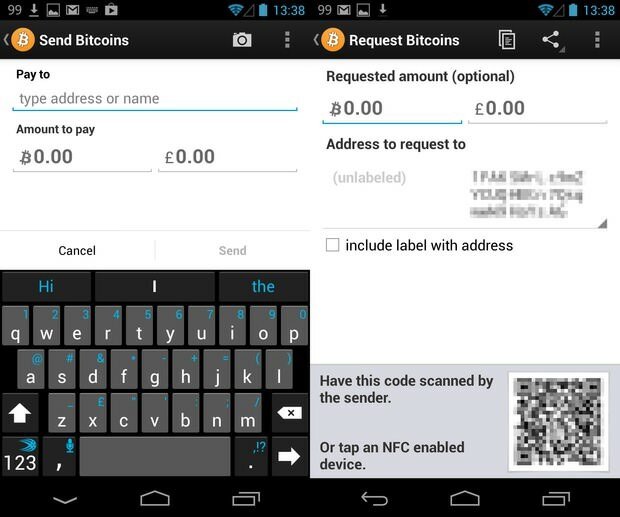 You can also send bitcoin by typing (or pasting) an address or by scanning a QR code. It also has more basic and very useful features like displaying a list of your transactions, and a PIN lock to make sure nobody accesses your wallet. You can also pick a fiat currency to display on the main screen of the app to show what your bitcoin balance is worth. The official Mt. 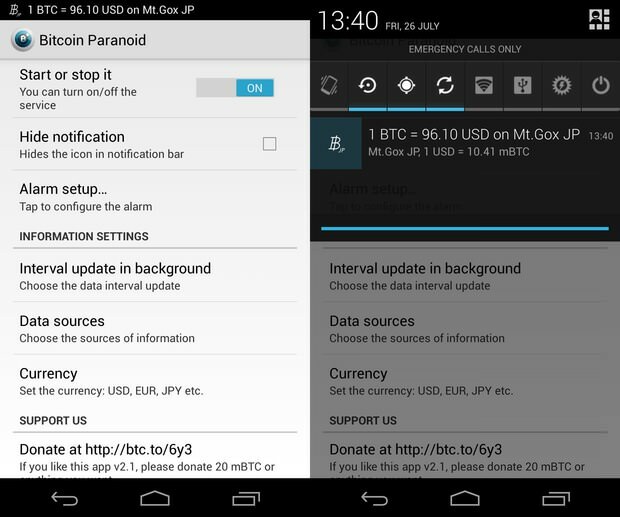 Gox app for Android takes you through a tricky process of authenticating to the website by creating an API key which is put onto your smartphone by scanning a QR code. However, once this is done, the app consistently crashes when opened. At least it did on our Nexus 4 which was running stock Android 4.2.2. We couldn’t avoid mentioning this one, but it has to be with a warning to avoid it. 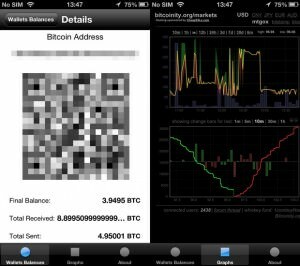 Bitcoin Wallet by Andreas Schildbach is the definitive bitcoin wallet app for Android. If you have a bitcoin wallet created by another app (e.g. bitcoin-qt on the desktop), it can be imported with ease via the backup menu. However, this is not compatible with the backup files created by the Blockchain app. The app features a pivoting list of your transactions, switching between received, sent and all. It also allows you to create and manage multiple receiving addresses. 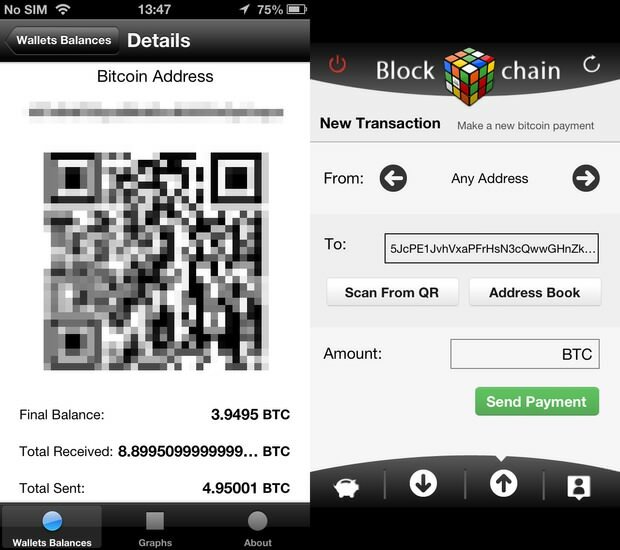 It also supports QR scanning for sending and requesting bitcoin. This is an app for those who are avid bitcoin watchers and need up-to-the-minute prices. This doesn’t give you an app or a widget. 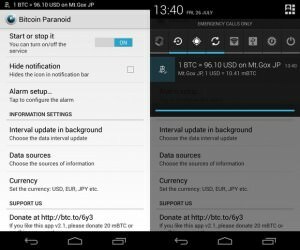 Instead, it provides a permanent entry in Android’s notification shade with the current exchange rate in your chosen currency. Conveniently, it not only shows what 1 BTC is worth in your fiat currency, but it also shows how much one unit of your fiat currency is with in BTC. E.g. One pound sterling is worth around 16.16 mBTC. This is the official Blockchain app for iOS – again made by Qkos Services Ltd. who made the Android version. However, this app has a distinctive style that sets it apart. 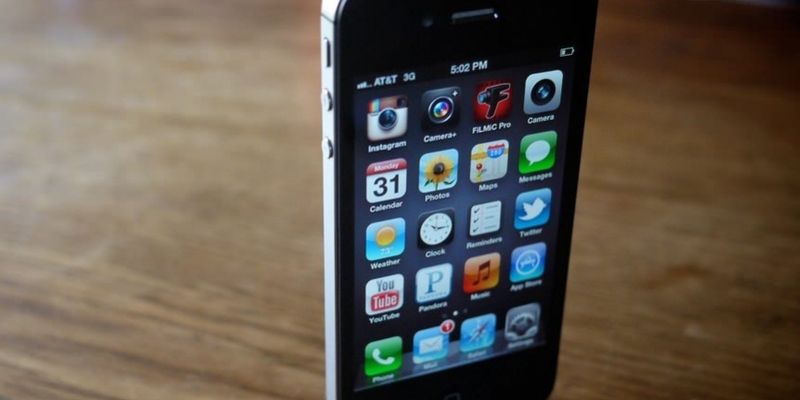 Its curved tool bars eat into the iPhone’s screen real estate, which makes viewing the list of transactions feel quite cramped even on an iPhone 5. Just as with its Android counterpart, you are saved the hassle of logging in with a username and password. Instead, you ‘pair’ the app with your Blockchain.info account by scanning a QR code from your desktop browser. Once paired, the transaction list looks identical to that of the Blockchain website, including tapping transaction values to toggle between BTC and fiat values. The lower toolbar lets you access pages for sending and receiving payments. Fortunately, there is an option to send payments by scanning a QR code too. The toolbar also lets you access your settings page on the Blockchain website. Overall, the app works very well, and the Blockchain.info website provides a pretty secure solution for keeping your wallet in the cloud. 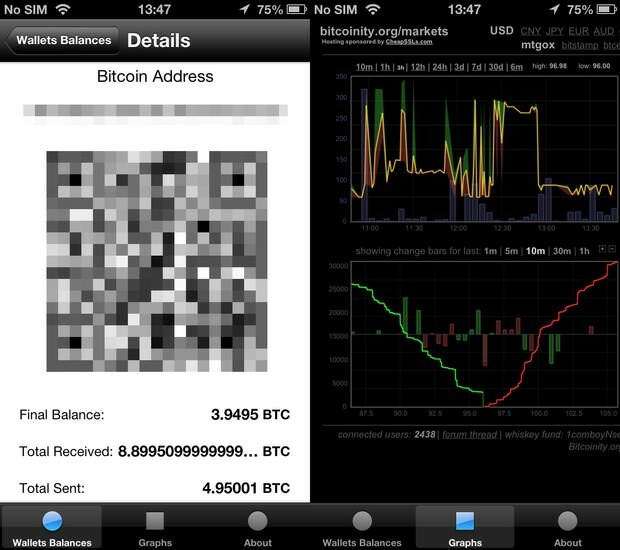 As such, this is my favourite app for handling bitcoin on iOS devices. This free app for iOS lets you keep your finger on the pulse of the cryptocurrency world. 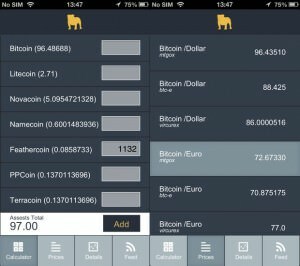 The first of four screens is a calculator where you may enter your holdings in several cryptocurrencies, and the app will calculate the total USD value. The next screen shows you regularly updated prices of bitcoin to USD and euro on several exchanges; it also lists Litecoin, Novacoin and Terracoin. The “Details” screen shows the high, low and volume (etc) of USD trades for bitcoin on Mt. Gox. The final screen shows Bitcoin and Litecoin news from several sources including Reddit and The Bitcoin Magazine. It doesn’t include CoinDesk yet, tut tut! With only two wallet apps on iOS, the options are limited. 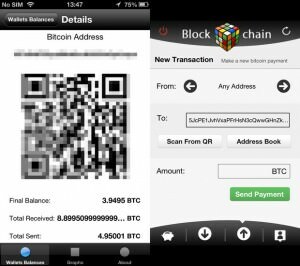 BitcoinViewer is a very limited form of wallet app in that, when supplied with a bitcoin address, it will display a QR code, current balance with the total sent and received bitcoin amounts. Fortunately, you can monitor more than one address too. The other section of the app shows a copy of the charts from Bitcoinity. At least you can use this to receive money, but you’ll have to find some other way to actually pay with your iPhone. The so-called third ecosystem isn’t without bitcoin apps either. Predictably, the options are thinner on the ground here, and not all apps work that well. First up with an unofficial Mt. 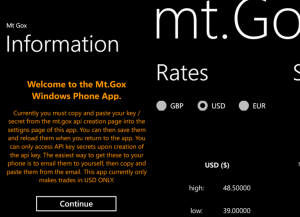 Gox app, called mt. Gox. The app allows you to place, buy and sell orders. It will also show you a summary of the currently open bids and ask orders that you have. Usability isn’t great, as you have to paste in the API key and secret text from Mt. 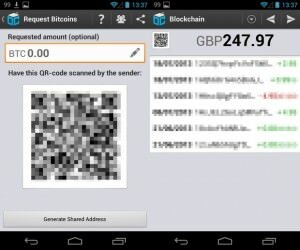 Gox – compare this to Android and iOS where you can authenticate your account by just scanning a QR code. For this app, the best way is to email the API key and secret text to yourself, then copy and paste them into the app from your Windows Phone email app. This app does just what its title suggests. 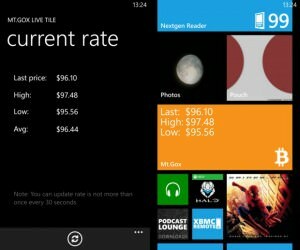 It provides a live tile giving market details of what the USD price of Bitcoin on Mt. Gox is currently doing. 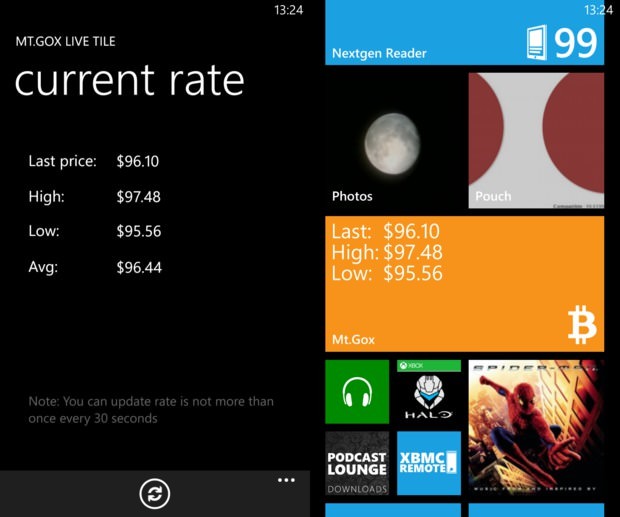 The app supports all three tile sizes of Windows Phone. The smallest size just shows an arrow to show whether the price is up or down. The largest will show the current price with the most recent highs and lows. 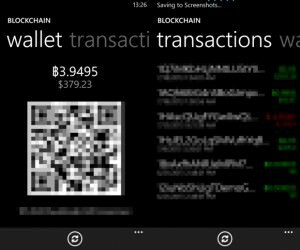 As the name suggest, this is the Windows Phone app for accessing your wallet in the Blockchain cloud. 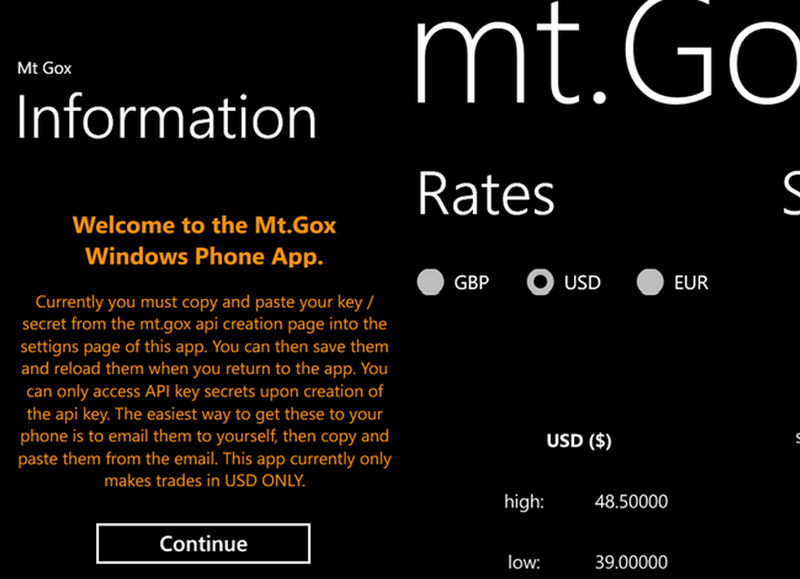 The app faithfully works within the signature design of Windows Phone by pivoting between views for your wallet and your transaction history. 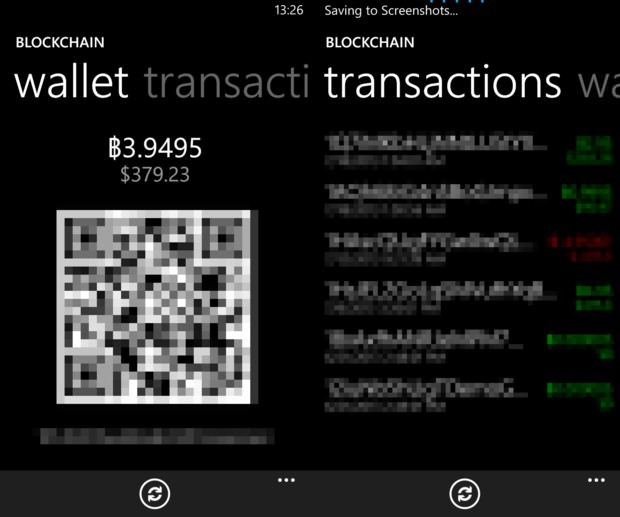 The wallet screen displays a QR code so others can easily send bitcoin to you. That is about all it does. In comparison to the official Blockchain app for Android, this incarnation is quite limited. There’s no PIN lock, and there’s no way to send money to other users. 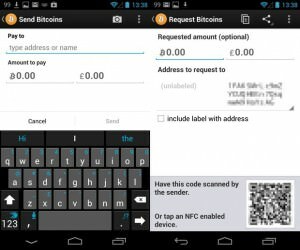 Overall, Android has the best support for not just bitcoin, but cryptocurrencies in general. Both iOS and Windows Phone have promising apps, but they are still missing key functionality that cryptocurrencies will need to put digital spending power in the hands of ordinary users.